The water in Bororen is disco loured and the taste is disgusting and causes diarrhea and skin complaints, says mother-of-three Kelly Brown. She lives at Bororen, a community of 150 residents who mostly rely on water from three bores operated by the Gladstone Regional Council. It is chlorinated to kill bacteria, but the unpleasant taste and color come from iron and magnesium in the water. Mrs Brown said yesterday the water was not always disco loured but when it was she was sometimes physically sick. Elements of tap water. "Three weeks ago there was so much chlorine that when I had a drink I threw up," she said. When her two-year-old son showered, his skin flared up. "As soon as he touches water, his skin becomes scaly and lumpy," Mrs Brown said. "Even when he drank the water there was a skin reaction." Prestige Water filtration system can help to improve your drinking water quality. 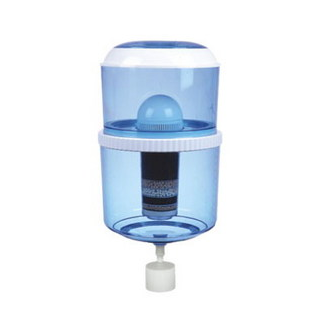 Our water cooler filter will remove most of the impurities you find in tap water.